A fundamental aspect to aging successfully is to feel respected and understood by others around. Practicing good communication skills, using effective strategies and technologies to help us initiate and keep conversations going with older people are essential to promoting their general health and well-being. This series of workshops introduces the core basics of communication with older adults (with special attention also given to those with special communication needs), and the advents of technological communication aids on the market for promoting continual communication between the old and the young. Interactive class activities will be used to facilitate participants to integrate the knowledge on communication into practice. The essence and challenges of communicating effectively with older people. Core basics of communicating with older adults and applications of effective communication skills with older people in real life experiences. Core strategies to communicate with older people with special communication needs. Building good relationships between the young and old through the breakdown of ‘hidden’ communication barriers. Advances in technological communication aids for enhancing communication between all generations. Aging is a natural process. Everyone likes to enjoy a successful aging at old age. One of the key components of successful aging is high level of engagement with life so much so that the integrity of well-being can be maintained. Therefore initiatives for the older people should aim at encouraging their social interaction and emphasizing on promoting well-being. This workshop is going to introduce the social activities that can enhance the well-being of the older people and achieve successful aging. Since senior community center is a platform to provide a variety of social activities to the older people, this workshop will use horticultural therapy at senior community center as an example to demonstrate the challenges in planning and conducting activities for successful aging. Family solidarity is the core value in traditional Chinese Hong Kong society. Mutual care, trust, support and reciprocity in a family can bring cohesiveness and harmony. Due to the variation of demography, culture, age and marital relationship, it leads to the changes of family structure and affects the intergenerational solidarity. This workshop aims at analysis the relationship between family solidarity and social changes. It is also important to understand the essential elements to establish and maintain intimate relationship among family and how to promote the message of intergenerational solidarity in the community level. There are about 20% of older people in Hong Kong report experiencing various types of abuse. The number of abused incident is ever increasing. Elder abuse exploits the dignity, the rights and the financial security, hence the well-being of the older people. Furthermore, it hinders the successful aging of individual. To this end, elder abuse should be made aware and be eliminated. This series of workshops aim at providing information related to early detection, crisis management and appropriate interventions with the elder abuse. People can have personal grow in any stage of life, including the old age. Further personal growth of older people not only benefits to themselves and their families, but also benefits to the society. In fact, older people can further grow in many areas during their old ages, for instance, creativity, self-efficacy, independency, effective coping, self-acceptance, and etc. In this series of workshops, trainer will provide details analysis and illustration to participants for their understanding of how the above-mentioned areas of personal growth of older people can benefit to older people, their families and the society. Participants could also learn different ways and strategies to help older people to achieve further personal growth in each of these areas. So that participants of these workshops can help more older people in their workplaces or in the community to achieve further personal growth and also successful aging. In order to provide good quality care giving services to older people, informal and family caregivers need to really understand their older clients or family members. It comes to the important question ‘how caregivers could better understand their older clients or family members?’ Without good listening skills, caregivers are unlikely to understand their older clients or family members. In this series of workshop, trainer would discuss in details many examples of inconsiderate listening and considerate listening. By avoiding inconsiderate listening and employing considerate listening skills, caregivers can have better chance to understand their older clients or family members. Trainer would also let participants know the evidences of good listening skills, so that participants realize whether their listening skills are beneficial to their communication with their older clients or family members. According to the findings of a research study conducted in 2006, the suicide rate for the people aged 65 or above is 30% out of the total suicide population. The percentage is doubled in comparison with the middle age group. As a caregiver like you we should treat this problem seriously. This series of workshops aim at exploring and analysis the causes and intervention for the older people who have considered or attempted suicide. Other than these, early identification of the high-risk groups, community education and prevention strategies will also be further discussed in the workshop. In late adulthood, the function of the body will gradually deteriorate. The physical changes such as the deteriorations of hearing and eye in which decreased their sensitivity to the surroundings in daily life and reaction will be slower. If the caregivers and older people neglect the home safety in everyday life, it will easily lead to accidents causing physical injury, and the frail elderly often require a longer recovery time. Therefore, to effectively prevent and avoid home accidents, preventive measures are necessary. The workshop is aimed at enhancing the skills and knowledge of the caregivers, such as the common home accidents, first aid, food handling, etc., to assist them in different aspects of daily life so that they can take care of the elderly at home carefully in order to achieve a rich golden age. Aging is an inevitable natural phenomenon of life. To enjoy healthy aging, having a healthy body is very important. Good physical health does not only prevent disease, but also enhance the quality of life. Therefore, to understand how to master the management of the health of the older people can help them achieve healthy aging. This workshop aims to explain the health management of older people, and discuss how to plan and implement health promotion activities to lead the older people to a healthy aging. Physiological functions of older adult may decline with age. Dental problem or sensitivity changes including taste, smell and sight senses are associated with the eating pattern and appetite of the older adult. Research studies have indicated that persistent inappropriate eating habit can cause malnutrition, which reduces the immune responses leading to an increased risk of infection. This workshop is aimed to build up the nutritional knowledge of the care givers from food selection and preparation. Several topics will be emphasized in the workshop include nutrition assessment, choosing the right food texture and consistency, as well as reading and application of food labeling. It enables the care givers to develop nutritional knowledge and skills through interactive discussion sessions and practices, so that, the older adults can receive a good quality of care in order to achieve successful ageing. In Hong Kong, there are already over one million of older people and the population is aging. They enjoy different kinds of activities in the community that are beneficial to their physical and psychological well-being. Health preservation in older people aims at keeping it in good condition and prolonging life expectancy. If older people have balanced diet, regular exercises and sleep, supportive social network, and positive thinking, they will certainly enjoy their golden age of lives. This workshop aims to have detailed discussion on how to preserve health physically and psychologically, so as to help both older people and their caregivers to improve their quality of life. Ways to minimize common somatic complaints, such as insomnia, constipation and anorexia. Physical exercise is very important for older adults. There are many resources and health education on the benefits and guidelines of exercise in the community. In fact, older adults with different health status not only need the types of exercise that are appropriate to their physical fitness, but also adjust their exercise goals based on their health history and conditions. The purpose of this workshop is to present the exercise needs of older adults, and to introduce physical exercise for older adults from different fitness perspectives and disease approaches. All older people want to have a healthy and flourishing living in their latest life. However, they need to perform several factors in order to achieve their healthy aging. This workshop will explain the definition of healthy aging and its importance towards our aging population. It will also introduce the healthy exercises, social activities and balance diet for older people to maintain their health. Finally, it will also explain the factors of becoming happiness for older people. Psychosocial well-being is one important indicator that reflects how successful older people are aging. Positive psychology, commonly known as the science of happiness, is an emerging field that can foster psychosocial well-being of older adults. It is founded on the belief that people want more than an end to suffering. People want to lead meaningful and fulfilling lives, to cultivate what is best within themselves, and to continue to prosper after retirement through social engagement and lifelong learning. This workshop presents an overview on how we can apply positive psychology interventions to build strengths and enable older adults to achieve the best things in golden life. Older people may have various needs in their later lives. However, we believe that everybody has the same hope of living happily and healthy. In fact, as long as we can understand and pay more attention to older people's needs , it can not only help to improve their quality of life but also enhance successful aging. Discussion on how to develop a good quality of life with successful aging, positive self image and weight management will be involved in the workshop. There is a saying that as we grow old, we learn to let go and enjoy our days. Surprisingly though, older adults need to cope with a lot of changes such as retirement, empty nest, or chronic illness in later life. In combating these challenges, they may encounter high stress, frustrations and anger. Informal and family caregivers are in a very favourable position to offer them with a helping hand. This series of workshops will introduce participants to issues and approaches to counselling older adults. Opportunities will also be provided to practice basic counselling skills for use in common situations to care our older adults. Overview of the counselling processes for older adults. Common counselling approaches for working with older people, including humanistic, behavioural and cognitive counselling. Practising basic counselling skills to address psychosocial and emotional problems of older adults. In the aging process, older people may encounter numerous age-related changes or major life events that trigger either adaptive or maladaptive psychological reactions. In order to enable our older citizens or soon-to-be-old to have a better later life, it is necessary to recognise their psychological needs and know how to promote their psychological well-being from individual and community perspectives. The aim of workshop is to enhance the participants' understanding on impacts of age-related changes or major life events on the psychological health of older adults. Emphasis will be placed on various strategies in promoting psychological well-being of older people. Although the old Chinese saying, troubles appear in eighty to ninety percent of our whole life, is not a scientific estimation, sometimes when older people face difficulties they would use this proverb to encourage themselves and to make them patient and resilient in adversities. So is there any way to enhance the resilience of older people? According to the evidences from studies of social science, resilience could be enhanced. This series of workshop aims to inform the participants the meaning of resilience and its relationship with various important factors that are found to correlate with it. Trainer would explain in details how to promote older people's resilience in several difficult situations in life, so that participants could understand how to help older people to face different adversities in their old age. Meaning of resilience and its relationship with posttraumatic growth, purpose in life, social support, religion and spirituality, self-transcendence, etc. Aging is a challenging process during which older people have to face a numerous age-related changes or major life events. These trigger different psychological responses and yearning for spiritual needs, including self-transcendence, the meaning of life, and the sense of belonging of older people. How older people interpret and accept these changes plays a crucial role in their self development. The aim of this workshop is to enhance the participants' understanding on the psychological and spiritual needs of older people, facilitate their self development in order to promote the psychological and spiritual well-being of older people. People live longer today because we have better health care and living environment. With the change of social, community and family structures, how older people cope with the transition period in old age? In this workshop, we will discuss the psychological issues of older people during the transition period. We will look into the psychological changes of older people in the later stage of their life and their coping mechanism. Strategies to help building older people self esteem and coping methods would also be discussed. Happiness may have different meanings to different people. The main secret on how to live a happy life is having a positive attitude and perspective towards life itself. Aging is a challenging process during which older people have to face a number of major life events and age-related changes. All these changes may create stress and negative feelings, and also affect the psychosocial well-being among older people. Thus, how to assist the elderly to achieve a happy elder life has become a very important issue. The purpose of this workshop is to give an overview of Cognitive Behavioral Approach, and let the participants to understand the relationship among thoughts, feelings and behaviors. Thus, they can learn ways to tackle the negative feelings by the positive thinking, in order to help the older people to achieve a happy elder life. During the late life, older people may face many changes in their lives. The loss of significant others, children moving away from home, deterioration in physical health may result in a decreased social participation of older people. Decreasing social participation may have significant impact on the psychological health of older people, for example, they may become isolated, feeling lonely and even helpless. In this series of workshop, trainers will equip the participants with knowledge about the psychological factors influencing the older people's social participation. Through group discussion and case study, participants can learn some useful strategies to improve the older people's social participation. Social strategies: Building social network among the older people and improving communication skills between older people and their caregivers. Everyone hopes can smile and be happy all the time. However, aging is a challenging process during which older people have to face a number of physical, psychological, social and spiritual changes. All these changes may create stress and also affect the emotional health of older people. Psychologists proposed a "formula for happiness" means that everyone can enhance happiness by developing the habits of happiness. This workshop will share and discuss with the participants how to develop the happiness habits of older people through interpersonal relationships, in order to enhance their happiness and achieve a joyful late adulthood. Cognitive-Behavioral Therapy (CBT) is an empirically supported treatment that emphasizes the important role of thinking in how we feel and what we do. It is based on the idea that our thoughts cause our feelings and behaviors, not external things (i.e. people and situations). The benefit of this fact is that we can change the way we think to feel and act better even if the situation does not change. Studies of CBT have demonstrated its usefulness for a wide variety of problems including mood disorders and anxiety disorders. This workshop aims to introduce cognitive behavioral therapy for older adults, in order to better equip caregivers to enhance the psychological well-being of themselves as well as the older people they work with. Aging is a challenging process during which older people have to face a numerous age-related changes or major life events, including role changes in families and societies, the deterioration of physical function and the death of spouse and friends. These may induce stress and cause emotional changes of the older people, and therefore affect their physical and psychological health. However, these may overlook by their family members or friends and which in turn impact the older people's quality of life. The aim of this workshop is to enhance the participants' understanding on changes and stress that may face in the later life and share different method of reducing stress from physical, psychological and spiritual approach, in order to promote the physical, psychological and spiritual well-being of older people. Older people face different changes in their physiological, psychological and social aspects, such as retirement, the deterioration of physical status, and loss of spouse and good friends in the late adulthood. These changes may cause older people and those soon-to-be old feel that they have no alternative and right to master their life and affect their psychological health finally. Psychologist claimed environmental mastery is one of the components of psychological well-being. This is important for an individual to have a sense of mastery and competence in managing the environment and make suitable choices for themselves. The aim of this workshop is to share different choices in late adulthood, let participants to understand older people could still master their life and have right to make choices, so as to enhance their psychological health. Explore different choices in the late adulthood. Older adults may need to adapt changes that arise during the course of later life. The changes may have impacts on the psychological health of older adults that deserves immediate attention by people around them. Counselling is one of the effective ways to promote the psychological well-being of older people when they face with the challenges. This series of workshops will equip participants with basic concept and skills in counselling the older people. Through group discussion and role play exercises, participants will be able to grasp the important skills in counselling the older people, so that they can provide effective counselling to help their older clients in facing their special situation in life. Due to aging of population, the care needs of older people increase continuously. Besides taking care of the older people daily needs, caregivers also need to take care of themselves. Especially for caring older people who are physically weak, caregivers need to acquire proper skills in mobilizing and transferring the older people in order to reduce the chance of injury. This workshop aims to equip participants with back care skills and transfer methods. In addition, it will introduce fall prevention and management in older people. With an aging population, there is an increasing number of older people having chronic diseases whom become frail. It is well recognized that “aging in place” is the choice to enable the frail older people to improve quality of life and live happily with their families. The clinical characteristics of frail older people include unintentional weight loss, exhaustion and weakness. All these could lead to disability and dependency and hence the need for long term cares. Therefore informal and family caregivers play a crucial role in caring the frail older people at home. This workshop aims at empowering the informal and family caregivers by introducing basic care tasks and essential skills in caring for the frail older people with chronic diseases at home. Emphasis will be placed on various direct physical care. Everybody wants to have a healthy life, and free of disease. To maintain good health in older age is not an easy task. It greatly depends on the mode of daily lifestyle, such as diet, rest, exercise, and even the coping skill of stress. If older people suffers from chronic diseases, it is of utmost importance to learn how to manage them and try to maintain as healthy as one can be. This workshop aims to discuss in details how to maintain physical and psychological well beings in everyday life for the older people with chronic diseases, apart from seeking medical advice, there are also some tips to control common signs and symptoms of chronic diseases, so as to optimize the quality of life. The practical tips to maintain psychological well being despite having chronic diseases. Methods to deal with long term somatic complaints, such as insomnia, constipation, anorexia, etc..
With reference to cancer-related statistics, cancer has become the number one killer disease in Hong Kong since 1985. The three most common cancers among males over 65 years in age are lung cancer, liver cancer, and colorectal cancer. For over 65-year-old females, the most common cancers are lung cancer, colorectal cancer and breast cancer. With modern technology and early diagnosis, however, the survival rate for cancer has been increasing. Research shows that some cancers can be prevented by having a healthy lifestyle. If the condition cannot be controlled, palliative care takes an important role for older people and their families. This series of workshops aims to explain the causes, treatments, and preventive methods for cancers which are common in older people, and introduces the concept of end-of-life and palliative care in order to improve the quality of care for older people and prepare their caregivers to walk in peace with old people through their last journey. Old people with chronic diseases are more susceptible to infections. This may be due to their low body resistance, the effects of co-morbidities, and their frequent hospitalization. Some examples of common infectious diseases among older people are influenza, tuberculosis, noroviral infection, scabies, and infectious skin diseases. In order to have better protection against or fight diseases, it is important to know diseases' nature, severity, and transmission routes. This series of workshops aims to promote proper hygiene, explore the common communicable diseases in Hong Kong, and educate on the standard precaution and proper management of the above-mentioned diseases. dermatological infection: scabies, eczema, and so on. Introduction: Many older people with chronic illness often miss the importance of exercise due to tiredness, drug dependence, and worries brought about by the worsening disease. In fact, proper exercise could not only improve body functions and self-care abilities but also help control the diseases, prevent other illnesses like osteoporosis, relieve stress, and improve quality of life. This workshop aims to introduce to caregivers the principle of exercise, safety issues, and exercise skills for old people with chronic illness. It will also include some examples of exercise programs and some precautions for older people with different chronic illnesses. Common excretory problems like incontinence, constipation often bring inconvenience, worry and even embarrassment to the older people and the caregivers. As people age, the genitourinary system and gastrointestinal system will undergo normal aging process, it is misleading to say that incontinence and constipation are normal for older people. Although these problems are common, yet early assessment, diagnosis and intervention may control the symptoms or even being cured. This workshop shares the information about continence problems of the older people, its causes, prevention, care and methods to improve the conditions, some common excretory problems will be discussed, the method of doing pelvic floor exercises will be introduced. The continence problems of the older people, its causes, prevention, care and methods to improve the conditions. Common excretory problems, such as urinary tract infection, diverticulosis. The causes and prevention of constipation, and the method of improvement. Respiratory diseases are common health problems in older people. In 2007, pneumonia and chronic lower respiratory diseases are the third and the fifth leading cause of death in Hong Kong respectively. If the older people acquire chronic respiratory diseases, they require long-term care and management. The diseases affect both the morbidity and quality of life in older people. Therefore caregivers play a crucial role in caring them. This workshop aims at empowering the caregivers by introducing basic knowledge and essential skills in caring for the older people with common respiratory diseases. Life is a journey, hence conforming to the inevitable order of living and dying. We are often excited in expecting the new life, but we seldom discuss how to prepare ourselves to face the end-of-life. That is a kind of blessing to be old. As a caregiver, have you prepared yourself to accompany your older people to walk through this part of the journey? This workshop is going to discuss how to face death, different needs in the end-of-life period and how to live with good bereavement, so as to assist the participants to face the end-of-life positively, accompany the older people to walk through the end-of-life journey and say “goodbye” peacefully. The musculoskeletal system forms an important framework to support the human body, it needs to be well maintained with good care. The normal aging process and the complications of some diseases may cause different level of pain and discomfort to the older people. In order to protect the skeletal system and joints, it is necessary to pay attention to the nutrition and exercises in the daily lives. The aim of the workshop is to introduce different musculoskeletal and joint problems of the older people, the causes, types and its management. It will also mention ways to protect the joints in the daily lives. Introduce different musculoskeletal and joint problems, such as osteoporosis, arthritis; the causes, types and management. The fall risk assessment of the older people and ways to prevent fall. Methods to protect the bones and joints, include diet and exercise. The role of the caregivers is very important, especially when the health of the older people is deteriorating. They are not only responsible in taking care of the physical and psychological needs of the older people, but also have to prepare and face the end-of-life together with them. Unfortunately, most of the caregivers are too devoted and neglect their own physical and psychological health. They may ‘burn out’ easily and their quality of life may be affected. This series of workshop is to promote the caregivers’ quality of life and prepare them to walk through the end-of-life journey with the older people peacefully by equipping them with basic knowledge of caring the older people, encouraging them to concern and look after themselves both physically and psychologically, and preparing them to accompany the older people to walk through the end-of-life journey. Due to the normal aging process and the effects of chronic diseases, the older people may sometimes complain of different levels of pain. If the pain persists and become chronic, it will definitely affect the quality of life. However, proper management may relieve the pain. The aim of the workshop is to introduce the common pain problems in the older people, the causes, types and also it will discuss about the proper methods to alleviate the pain. The different types and causes of the common pain problems in the older people. The methods for chronic pain relief. Well balanced diet, good rest and exercise are essential elements for healthy lifestyle. However, the pace of the people in Hong Kong is often so quick and anxious, as a result, different somatic complaints may arise. As time goes by, they may become chronic diseases. According to the report from the Census and Statistics Department (2009), there are approximately 70% of older people in Hong Kong suffering from chronic diseases. The common chronic diseases of the older people include hypertension, diabetes mellitus, heart disease and stroke. The aim of this workshop is to introduce different kinds of common chronic diseases of the older people in Hong Kong, the causes and the management; also the preventive methods will also be discussed. Introduce the common chronic diseases of the older people in Hong Kong which include hypertension, diabetes mellitus, heart diseases and stroke. Discuss on the causes of different kinds of chronic diseases and the management. Stroke is the fourth leading cause of death in Hong Kong and approximately 3000 people die of stroke each year. The function of brain cells requires a constant delivery of oxygen and glucose from the bloodstream. A stroke is caused by the interruption of the blood supply to the brain, caused by a blood vessel bursts or blocked by a clot. The symptoms that follow a stroke depend on the area of the brain that has been affected. Stroke survivors often have complex rehabilitation needs, progress and recovery; therefore stroke rehabilitation and home care are essential for post stroke client to regain the lost abilities and to reach the highest possible level of independence. The aims of this workshop are to discuss the cause, symptoms and treatment of stroke, the stroke rehabilitation and home care, as well as the prevention of second stroke. Chronic pain will reduce the mobility of the older people. It will also affect the psychological and social welling of the older people. Older people suffering from chronic pain will found to have reduced in range of movement of the joint. They will have difficulties in standing and walking that will greatly influence their daily activities. Chronic pain will even bring negative emotion for older people, such as loneliness, helpless and depression that will greatly reduce their initiatives on physical activities. Reduced in physical activities will lead to joint stiffness and the problem of pain will be further aggravated. Therefore, the aim of this talk is to introduce the common pain problems and their cause among the older people. It will also introduce the proper methods to alleviate the pain so as to reduce influence of chronic pain. Introduce the common pain problems and their causes among older people. Teach the proper exercises to reduce pain. Life is a journey, hence conforming to the inevitable order of living and dying. We are often excited in expecting new lives; however we seldom discuss how to prepare ourselves in facing the end-of-life positively. Getting old is a kind of blessing. As a caregiver, have you prepared to walk through the last journey with the older people? The aim of this workshop is to encourage the participants to face the end-of-life positively, to assist them to walk through the last journey with the older people, and say “goodbye” peacefully. According to the health statistics in 2009, approximately 70% of older adults of the total elderly population are suffering from chronic diseases in Hong Kong. Common chronic diseases include hypertension, diabetes mellitus, cardiovascular disease etc. An increasing number of research studies have shown that healthy lifestyle including healthy eating and regular exercise is of significance for health maintenance. This workshop emphasizes on the nutrition and exercise management of chronic diseases. It enables participants to develop knowledge and practical skills to manage and prevent the diseases. Introduce the causes, manifestation and treatment of common chronic diseases (Hypertension, diabetes mellitus, cardiovascular disease, stroke, chronic kidney disease, chronic obstructive pulmonary disease etc) among the older adult population. Illustrate effective exercise plans about the management of chronic disease. Explore the chronic disease management through diet control. The older adults may suffer from various eating and swallowing difficulties due to diseases and health deconditioning. Thus, it is important that the caregivers have solid knowledge and appropriate skills in assisting the older adults so as to ensure them a balanced diet, make eating as an enjoyable moment and prevent any complications induced by choking. This workshop would emphasize on the practical skills training and case discussion, in which the participants could understand the common feeding problems in the older adults, and develop the essential skills in proper feeding process such as appropriate environmental settings, the use of feeding aids and hands-on technique etc. Joint pain was the common problem among older people. The main reason of their joint pain was degeneration and overuse. Chronic pain will reduce their mobility and affect the psychological and social welling of the older people. It will also bring negative emotion for older people, such as loneliness, helpless and depression that will further aggravate the problem of joint pain. This workshop was aimed to introduce the common joint pain of older people. It will highlight the ways of joint protection and methods of relieving pain as well as healthy exercises to prevent the degeneration of the joint. Although death and suffering are inevitable, death is still a taboo in the society. People choose to avoid it. However, in recent palliative care, pain of the end of life patient can be relieved through symptom control and holistic care in order to enhance quality of life. Spiritual care is the essential element in palliative care. For the end of life patient, although illness is incurable, they can experience healing through enhancing spirituality. Patients and their relatives can achieve life integration, restoration of relationship and peace in soul through spiritual healing. They can also experience spiritual growth through finding the meaning in death. The aims of this workshop are to introduce the concept of palliative care and to understand the role of spirituality in end of life. Spiritual intervention skills are also illustrated, in return, to help the caregiver practice spiritual care, in the end, facilitate the older person to die in dignity, in peace and in no regret. According to the report of the health statistics in 2009, approximately 70% of older adults were suffering at least one chronic disease in which hypertension, diabetes, stroke and chronic obstructive pulmonary disease were the most prevalent diseases among the older population. Apart from drug treatment, diet control is vital in chronic disease management. Different diet treatments are used for managing different chronic diseases. Nutrition management is not solely done by a single diet. Therefore, this workshop will focus on diet treatment for chronic diseases. Through the group discussion and practice, caregivers will be able to understand the chronic disease management by diet control for the older adults. With reference to the cancer related statistics, cancers have become the top killer of Hong Kong since 1985. The three most common cancers among those over 65 year-old male older people are lung cancer, liver cancer and colorectal cancer. For those over 65 year-old female older people are lung cancer, colorectal cancer and breast cancer. With the modern technology and early diagnosis, the curative rate is increasing. Some cancers can be prevented by having healthy life-style. If the condition is not under control, palliative care takes an important role for the older people and their families. This workshop aims to explain the causes, treatments and the preventive methods of the cancers which are common in older people; and introduce the concept of palliative care, so as to improve the quality of care of the older people and prepare the caregivers to walk through the last journey with the older people peacefully. Introduce common cancers of older people, e.g. lung cancer, liver cancer, breast cancer and colorectal cancer. Exercises are not only important in preventing chronic disease but also essential in controlling the progress of chronic diseases. Different chronic diseases require different types of exercises. Exercises should be specific, correct and continue so as to control the symptoms of the diseases. Older people are common to have chronic disease. It is necessary for them to know the correct ways and practical tips of exercise. The aim of this workshop is to introduce common chronic diseases among older people and different types of exercises so as to enhance the understanding and lessen the misconception toward exercise. Although both death and suffering are inevitable, death is still a taboo in our society. People choose to avoid facing it. However, in recent Palliative Medical Treatment, the pain of an end of life patient can be relieved through symptom control and holistic care, therefore enhancing the quality of life. Spiritual care is an essential element in Palliative Care. Though the illness is incurable, the patient can still experience the healing through enhancing spirituality. They can also experience spiritual growth through understanding the meaning of death. The aims of this workshop are to introduce the concept of the end of life care and the ethical decision in the last stage of life. Spiritual intervention skills are also illustrated to help the caregivers practice spiritual care towards the end of lives, helping their clients face death with dignity, in peace and with no regrets. In recent research findings, it is found that people with early dementia present with marked memory problems, especially short-term memory. Commonly, they will easily forget the location of object storage, turning off the stove before leaving their home or showing up at their friends' gathering. This series of workshop aims to enhance informal and formal caregivers' skills in planning and organizing a five-week, individualized memory enhancement program for people from early to middle stage of dementia. After completion of this workshop, participants will complete their own, personalized training kit. Dementia is a progressive degenerative disease which affects the cognitive ability of the older people, and gradually impedes their self-care independence and social interaction. A goal-directed, therapeutic activity not only can improve or maintain the functional capabilities of the older people, but also enhance the social functions of the older people. This series of workshop aims to enhance caregivers' skills in planning and organizing therapeutic activity for people with dementia at various stages and different living environments. Caring people who has dementia was a challenging task for both formal and informal caregivers. In particular, they need to provide day-to-day care such as feeding, dressing, bathing and handling behavioral and psychological symptoms like wandering, aggression, delusion and repetitive behavior. This series of workshop aims to equip participants with up-to-date knowledge on dementia and to enhance their skills in caring for older people with dementia. Caregivers can therefore provide quality care for people with dementia. Dementia caregivers report that they frequently experience high levels of stress. Too much stress can be damaging to both the caregiver and the person with dementia. Caring for the self is one of the most important - and one of the most often forgotten - things one can do as a caregiver. When caregivers' needs are taken care of, the person they care for will benefit, too. This workshop aims to help caregivers to develop ways to relieve the stress and burden of caregiving from both physiological and psychological perspectives. It is very important for everyone to participate in meaningful activity. Research study related to dementia had shown, accurate selection of activity not only prevent people with dementia from reduction of physical functions and behavioral problems, but also improve communication skills effectively. With this implementation, patients and their care givers' quality of life can be enhanced. The purpose of this workshop is to let care givers understand the needs of people with dementia by promoting suitable activities and learning exercises to prevent dementia. Dementia caregivers report that they frequently experience high levels of stress. Too much stress can be damaging to both the caregivers and people with dementia. Caring for the self is one of the most important - and one of the most often forgotten - things one can do as a caregiver. When caregivers' needs are taken care of, the person they care for will benefit, too. This workshop aims to help caregivers to develop ways to relieve the stress and burden of caregiving both physically and psychologically. There are up to 90 percents of older people with dementia exhibited various types and level of behavioral and psychological symptoms during the progression of the disease. BPSD can be generally categorized into “behavioral symptoms” (e.g. wandering, rummaging) and “psychological symptoms” (e.g. hallucination, delusion and depression). BPSD significantly affect the quality of life of both caregivers and people with dementia. This workshop aims to equip participants with knowledge and effective skills, through demonstration and practice as well as case discussion, to handle behavior and psychological problems in people with dementia. Caregiver always become so concerned about caring for the older people with dementia, they may lose sight of their own needs and overall well-being, and finally become very stressful. This workshop aims to discuss the caring needs of people with dementia, caring techniques, communication skills, behavioral management strategies as well as the community resources available for this group of clients, therefore, promote the quality of life of caregiver and the older people with dementia. People with dementia are characterized with a decline in cognitive functions and impairment in daily living, some of them may also have emotional and behavioral problems. While taking care of the dementia people, caregivers will encounter various difficulties and pressures. These not only increase the burden of caregivers, but also influence their physical and psychological well-being. In fact, if caregivers have good knowledge and caring skills on the disease, it will definitely help to release their burden and improve their quality of life. 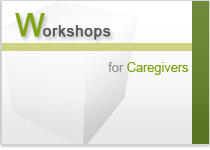 This workshop aims to equip the caregivers with in-depth knowledge about various interventions and practical tips. It enables the dementia older people to enjoy a respectful and prosperous life by providing a high quality of care. Many studies have proved that older people with dementia receiving training can delay the deterioration of the disease and even improve their condition. Daily training activities can reduce their behavior problem such as wandering, disorientation etc. They can also help to control their emotion and enhance their cognitive function. This workshop aims to introduce different training and therapies in treating dementia. Practice and discussion will be conducted to assist the caregiver to apply the knowledge during their caring with dementia patient. In spite of advanced medical technology, there is still no curative treatment for dementia. Many research studies have being shown that preventing dementia should be started with the daily living for older people and developing healthy living. This workshop is mainly introduced what is dementia and various preventive methods, including regular exercise training, healthy diet, cognitive training and stress management in order to get rid of dementia. With a rapidly ageing population and people living longer, informal and family caregivers are confronted with challenging tasks of caring for older people either living at home or in care settings. It is of utmost importance for caregivers to first take care of themselves before they are able to invest energies to take care of older people's needs. These workshops place emphasis on caregivers to gain strength and grow stronger when performing their endless daily care chores. They also provide suggestions on handling caregivers' psychological stress and to effectively use supportive community care services to serve their purpose. As people come close to late adulthood, they may face lots of changes and experience major life events. One of the common issues is relocation. When people get older, the thought of moving from home to residential care home may arise. Both older people and their caregivers will need to be actively involved in the process of settling into residential care homes and to well-collaborate with the health care staff so as to help older people to cope with this transition. The aims of these workshops are to increase participants' understanding towards the residential care needs of older people and how to make successful adaptation from home to residential living. Although “Aging in place” is a main theme advocated by the Hong Kong Government to keep older people at home; Personal, social and health-related factors mean that some older people may choose residential care homes as an alternative to living at home. In such case, choosing residential homes must be very prudent so as to alleviate the anxieties and worries of both the older people and their family members. The quality of care provided by these homes is essential in ensuring that the older people live in a safe and happy environment. This series of workshop aim to assist older people and their family members to know more about the monitoring systems of residential care homes in Hong Kong and how homes ensure that quality of care is provided and maintained. The promotion of effective communication channels between staff, older people and family members in homes will also be addressed. As the Chinese proverb says, “Good neighbours are more helpful than distant relatives”. This year, Hong Kong Government actively promotes “Care for the older people” and encourages people of different age groups to care for the older people. They can help the older people stay in touch with society and establish supportive networks in the neighbourhood. These series of workshops aim to provide information to formal and informal caregivers, as well as volunteers with better understanding of home care and safety, effective communication skills with older people, and ways to maintain good social and neighbourhood support, so as to achieve “Ageing in Place”. Accidents are uneventful occurrences in residential care homes for older people. As a result of the ageing process, older people are known to be at a higher risk of accidents and injuries, with undesirable consequences of pain, fractures and possible fatality ensuing. In view of this, raising awareness of safety in care home settings through the promotion of prophylactic measures and appropriate risk assessment are all considered to be active measures to avoid unnecessary accidents. Furthermore, proper management and attitude of staff in handling the accidents can minimize complications and even save the lives of older people. This workshop aims to enhance the knowledge of how to manage common accidents in residential care homes for the elderly. It will introduce different methods of risk assessments, common accidents and its proper management in care home settings. In addition, current healthcare policies governing safety of homes will be introduced. It is essential for us to have a clear understanding about the physical and psycho-social changes as well as the needs of older adulthood in order to hold a successful activity in elderly centre or residential care home. These series of workshops aim to introduce the needs and characteristics of older people and how to maintain effective communication with them. By means of lectures, contextual role plays, group discussions to learn the core skills of group work and programme design, participants will learn how to plan and implement a tailor-made activity for older people. Technology has numerous advantages and makes caring tasks easier and faster, especially in home care. In recent years, the “Smart home” technology helps to keep older people living at home safer and reduces home accident. Electronic devices and system are used in elderly care such as using GPS and RFID system for older people with impaired memory and getting lost in the street. This workshop aims to provide foundation of knowledge to participants to use technology to help older people to stay in the community and practical tips for choosing appropriate technology devices or products. The World Health Organisation (WHO) in 2006 initiated the “Age-friendly city” project which encourages active ageing by optimizing opportunities for health, participation and security from the eight essential elements of age-friendly city in order to enhance the quality of life of people as they age. These series of workshops aim to introduce the related community resources for older people as well as the tips to create safe home environment. Participants will learn how to help older people to develop their support network and enjoy socially to strengthen their sense of belongings and security. Essential elements for older people to live in their familiar community to maintain independent life as well as enjoyable golden life will be emphasised. Occupational health and safety (OSH) is important in residential care homes. Effective preventative measure can minimize the risk of injury. It can also ensure the health of healthcare staff as well as residents. Healthcare staff should equip themselves with OSH knowledge and take appropriate intervention to ensure a safe working and living environment in residential care homes. This workshop aims to introduce OSH in residential care homes. The common OSH issues in the residential care settings, its prevention and handling method will be discussed. In addition, the reporting mechanism and management in case of accident will also be mentioned. The health status of the residents in residential care homes varies greatly, some may be healthier whereas some of them may be frailer; in addition, their health condition may change suddenly. Healthcare workers need to be vigilant all the time, they should be highly aware of the change of the conditions of the residents and provide proper management. Regular health assessment can also help to have better planning of the nursing care for the residents. In view of this, a simple, prompt and appropriate health assessment is very useful to obtain relevant information. This workshop aims to introduce basic health assessment for the older people living in residential care homes, also it will introduce the proper management and nursing care when abnormalities are detected. Different systems, for example, cardiovascular system, gastrointestinal system and neurological system. With a rapidly growing ageing population, informal and family caregivers are confronted with challenging tasks of caring for older people either living at home or in care settings. It is important for caregivers to know the practical resources and how to well use it for taking care of the older people. This workshop places emphasis on caregivers to gain strength and grow stronger when performing their endless daily care chores. It helps to empower caregivers' capacity and knowledge of how to effectively use supportive community care services. Strategies to handling and minimizing caregivers' stress?? Overview of supportive community resources ? Do you thoroughly understand the types of community care support service that are providing for the community dwelling older people? Recently, the Government is promoting the policy of ageing in place. It encourages the older people to live in a familiar environment where it is subsided with a range of community care support services. When entering the latest life, apart from body health, inner beauty is also needed. This workshop will explore the importance of ageing well; introduce the knowledge on nutrition and alternative therapy to achieve well-being. It will also teach the community-dwelling older people to make good use of the community resources to build up a positive self image and maintain a high quality of inner beauty in order to lightening the latest life. We have already known that Hong Kong is approaching into a super-aged society with nearly one-third older population after twenty-five years. It leads to high demand on long term care services, but it is closely related to the sufficiency of community support services. Therefore, a wide range of community care support services provided in the community is the most important criteria for the older people to age in place. These series of workshops mainly aim to discuss the underlying concepts of aging in place in Hong Kong and understand the essential elements to build up an age-friendly community so as to actualize aging in place. Participants will also learn and get to know different kinds of community care services in Hong Kong in order to help the older people to live in a familiar community to maintain independent life as well as enjoyable golden life.